Allegro Medical presents the Select Personal Care Incontinence Pads. 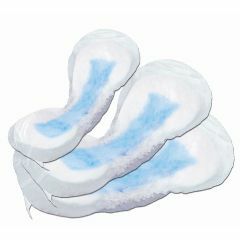 A contoured, personal care pad designed with moisture-proof backing for use in regular underwear. Three levels of absorbency to meet incontinence needs. Contoured shape conforms to the natural curves of the body for a comfortable fit. Blue acquisition layer draws fluid into product and away from skin. Gentle elastics form a cup shape that enables a secure fit and channels fluid. Adhesive strip securely holds the pad in position in regular underwear. Packaged for hygienic protection. Discrete, easy to change and dispose. Latex-free.